The head of the African soccer confederation has expressed satisfaction with Cameroon’s preparations to host next year’s African Cup of Nations, a statement at odds with the body’s position last week when it declined to back the country. Confederation of African Football president Ahmad said Tuesday on a visit to Cameroon that CAF had “never thought of” and “never considered” dropping Cameroon as host. “It is left to Cameroon to tell us,” said Ahmad, who is from Madagascar and goes by one name. “We are not the ones organizing (the competition). It is Cameroon that is hosting the competition. Ahmad’s position that CAF had no problem with Cameroon’s preparations contradicted statements made by the confederation after a two-day executive committee meeting last week. Then, CAF declined to confirm Cameroon as host for the tournament next June and July and instead delayed a decision until the end of next month and after at least two more inspection visits. Cameroon has been criticized for serious delays with stadiums and other infrastructure and is in the midst of a violent separatist rebellion in the west, where two tournament host cities are located. CAF would first send a joint CAF-FIFA team to assess the security situation this month, it said, and then inspect infrastructure before deciding if Cameroon can hold Africa’s top soccer tournament. 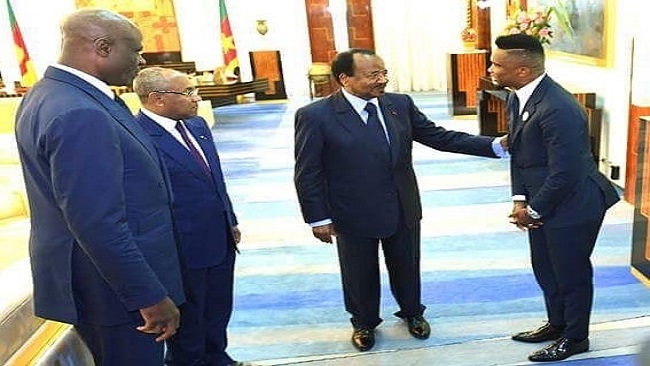 Ahmad’s visit to Cameroon this week was also contrary to what CAF said last week, when it decided to hold off any inspection visits until after the Cameroonian presidential elections, which take place on Sunday. President Paul Biya is seeking another term to extend his 36-year rule in Cameroon. That election could be a catalyst for more violence in the southwestern and northwestern regions, where English-speaking separatists have been engaged in bloody fighting with government forces since late 2016. Cameroon is about 80 percent French-speaking. Ahmad said he had decided to visit Cameroon on the invitation of former Cameroon striker Samuel Eto’o. “It is thanks to him that this visit has been organized in order to clear the air on every front,” Ahmad said. CAF has no “Plan B” for the tournament, Ahmad said, a tournament which will be the first African Cup to be increased from 16 to 24 teams, placing additional pressure on Cameroon’s creaking infrastructure. Despite Ahmad dismissing the notion of a “Plan B,” Morocco has been mentioned as a possible replacement host. If Morocco did stand in, it would be the fourth straight African Cup to be moved from its original host country. South Africa stepped in for Libya in 2013, the tournament was switched from Morocco to Equatorial Guinea in 2015, and Libya again backed out of its hosting last year, leaving Gabon to host at the last minute. Cameroon’s team is the African champion and was hoping to defend its title on home soil.